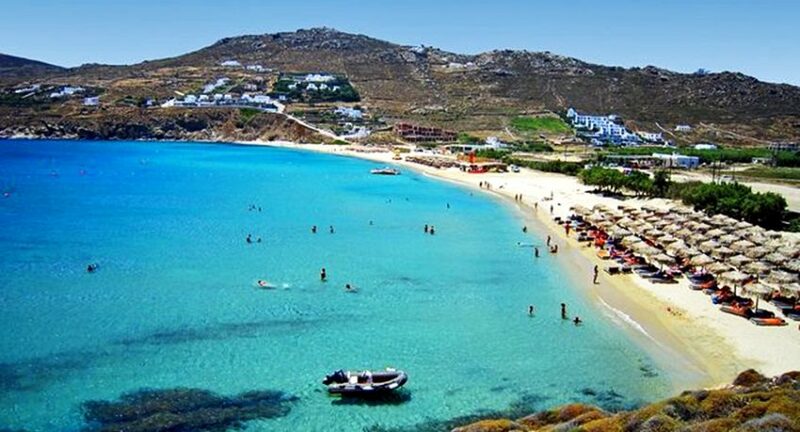 Kalafatis is one of the largest bays in Mykonos, and is a beach that combines everything, relaxation, good food and entertainment. The Blue flag waving on this beach for many years. It has very soft sand and crystal clear turquoise waters, and is one of the most famous beaches for water sports. The last few years, takes place in this beach the European freestyle windsurfing race, that’s why surfers love it here and come from all over the world to compete against each other and show their skills. The feature of this beach that makes it stand out from the rest, is that it is like a beautiful seaside village, there are many trees, which offer shade and coolness, and in combination with the golden beach and the view creating an idyllic landscape. There are many restaurants with delicious seafood and you can enjoy Greek cuisine and some of Mykonos’ traditional recipes. It is separated approximately in half, on one side the swimmers and on the other side the fans of water sports, so that everyone can enjoy a swim without being disturbed or bothered. Access is easy, either with a regular bus service or by another means of transportation. There is also a diving school at the beach, for those who want to explore the magical underwater world. If you want to enjoy short trips, you can take a boat that goes to Tragonisi, an island that has many caves. It is said that a monk lives there and if you’re lucky, you might see him! Distance from town: 12 km.